Metamaterials that can manipulate an incoming signal that represents data and emit an altered wave that equates to an answer could lead to low power picosecond analogue computation in every home. Metamaterials are composite materials whose structures have been designed to carry out a function, in this case to compute in an analogue way an incoming signal or wave. Computers today are digital, meaning they calculate using ones and zeros. Those ones and zeros would represent an equation’s figures, while an analogue process uses an electromagnetic wave’s amplitude and frequency, for example, to represent such figures. University of Pennsylvania researchers have created a polystyrene plastic metamaterial that can manipulate electromagnetic waves in such a way to compute an answer. “We can design meta structures that can solve integral equations for any given input,” says University of Pennsylvania electrical and systems engineering department’s H. Nedwill Ramsey professor, Nader Engheta. “The choice of plastic is not crucial you can choose other dielectric materials in which you can create these air holes to achieve similar functionality.” The air holes in the plastic are key elements of this computing structure. A dielectric material is an electrical insulator that electric fields can polarise. Examples of dielectric materials include glass and rubber. 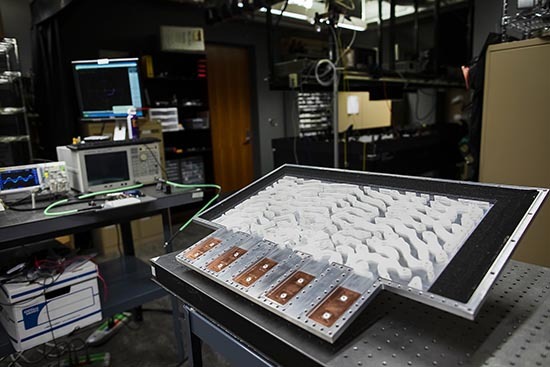 To make the technology more practical for everyday computing, the goal is to scale down the technology to where light waves could pass through a microchip-sized metamaterial analogue device. The use of light has been described as photonic calculus. Engheta and his fellow researchers are proving that the concept works using large metamaterials, a two-square feet (0.18 square metres) polystyrene plastic with wave guides that feed in the signal and output the answer. The size of the material was to match the wavelength of the microwave; so it was about eight wavelengths wide and four wavelengths long. In that 0.18 square metre structure it is the pattern of hollow regions that are designed to solve an integral equation of the incoming wave’s parameters, phase, amplitude, for example. 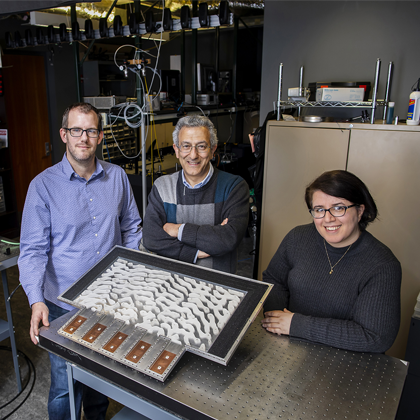 “Controlling the interactions of electromagnetic waves with this Swiss cheese metastructure is the key to solving the equation,” Estakhri explains. “Once the system is properly assembled, what you get out of the system is the solution to an integral equation.” Whether the metamaterial structure is 0.18 square metres or on the micron scale, the pre-set equation, designed into the structure, can be solved with any arbitrary inputs; the phases and magnitudes of the waves that are introduced into the device. Because dielectric materials can be used by 3D printing technology, Engheta says: “Someday you may be able to print your own reconfigurable analogue computer at home.” The research was supported by the United States (US) government Assistant Secretary of Defense for Research and Engineering’s basic research office, under its Vannevar Bush Faculty Fellowship programme, and the US Navy’s Office of Naval Research. Groundbreaking idea for vehicle manufacturers, paint your car solar!